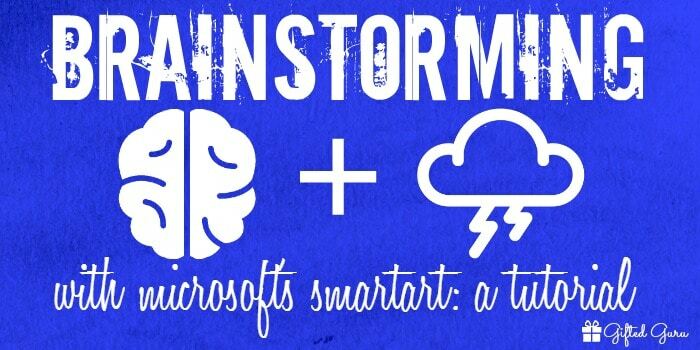 Brainstorming with Microsoft’s SmartArt is an easy and free way to make brainstorming in class a breeze. Brainstorming is one of the most common classroom techniques, and Microsoft’s SmartArt can make it easier than you ever imagined. There’s no need to invest in graphic organizers when Microsoft’s SmartArt is there at your fingertips for free! I’ve created a little tutorial to show you two ways I use SmartArt to assist with brainstorming in class – as a template to print out or as a model to follow that I can draw on the board myself. Set a time limit ahead of time, slightly shorter than what you think it will actually take. This adds a little energy to the discussion. You can even let a timer go. Sometimes constraint aids creativity! Break students into groups to brainstorm and then gather again as a whole group to share ideas for a simple change to the usual way. This lets quieter students be heard more. If the group uses a piece of paper or white board to generate ideas, give each student in the group a different color marker so you can see who wrote what. Prime the pump a little bit. Getting the discussion going before you start trying to generate ideas makes it more likely you won’t hear the cricket sounds that often accompany questions asked cold. If you haven’t used Microsoft’s SmartArt for brainstorming before, I hope you’ll find this tutorial useful and give it a try!